Supreme Air provides Air Conditioning, Heating and Plumbing Services, Repair, Installation, Maintenance, and Tune Up in Owings Mills, MD and surrounding areas. Professional. On-Point. No BS or high pressure to rack up the amount of the bill. On arrival checked thermostat was calling for cooling. Measured return temperature, supply temperature, amps, voltage, voltage absorption system. Inspected electrical connections, customer has the wrong filter size, used a vacuum to clean condensate drain line, and contactor is ok. Customer is due for service agreement renewal, but she was in a meeting so she will renew it with the office. Will return Monday to replace 40 gallon gas water heater. During operations inspection I noted that unit #2 & #3 had pitted and burnt blower motor contactors. I finished the operations inspection and went back on the roof to replace the parts. I tested each unit to ensurse proper operation after replacing the parts. Both units are operating normal. I replaced the filters for each unit. I tensioned the blower belts again since they had worn slightly since being replaced. I cycled the units through all modes of operation. Unit #2 & #3 need to have 2) 2pole contactors for the blower motors replaced. Otherwise all units are operating normal. Replace omen single handle positemp cartridge in master bath shower. 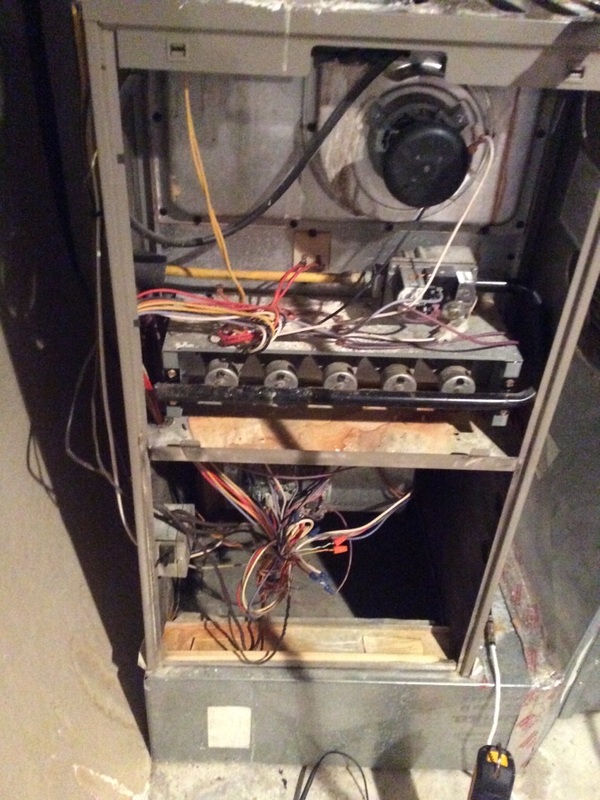 Replace the heating control board with new sparkler assembly. Upon arrival I went to system and tested operation. Verified control board not sending voltage to Igniter, found slight burn mark behind board. Removed old furnace control board and replaced with new. Swapped wire to wire and checked connections. Returned power to system and tested heat. Spark Igniter lit flame and unit started heating. Continued to test and checked heat rise and amp draw. Unit operating normal at this time. 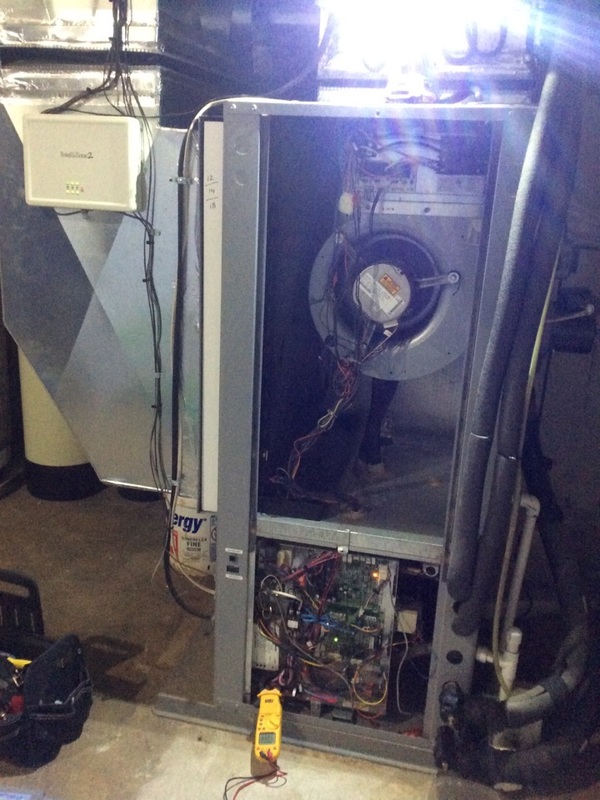 Fall pm 02/12/19 on arrival set unit to call for heat measured supply and return air temp measured voltage and amps inspected electrical connections checked drain and cleaned checked filter is cleaned unit operating normal at this time. Chris was here on the 9th and found bad control board and spark igniter . We need to come back and replace parts to get unit up and running. Space is at 70 degrees now . Warrantied per Alex. Upon arrival customer informed me that new furnace stopped working yesterday but is working today. During diagnostics I found condensate line clogged up to furnace, tripping pressure switch. Traced pvc and found it exits outside near condenser and is frozen solid. Found emergency pan and main drain line were flipped during install. Old pvc pipe was running underneath furnace drain which was causing it to freeze back into pipe. Swapped drain lines and tested operation. Unit operating normal at this time. Call was sent to the sales department. Customer would like estimate on ductwork. I replaced the filters and belts for each unit. I made sure that the belts were properly tensioned. I then checked the operation of the units in heating mode. Units #2 and #3 are operating normal. Unit #1 goes into a lockout because the spark igniter never gets voltage from the control board. The inducer works, the pressure switch closes, all safety devices are closed and the gas valve opens but never ignites. I made an estimate to fix this unit and also got part numbers for the parts needed. This unit is not operating at this time and will not heat until the board and spark igniter are replaced. 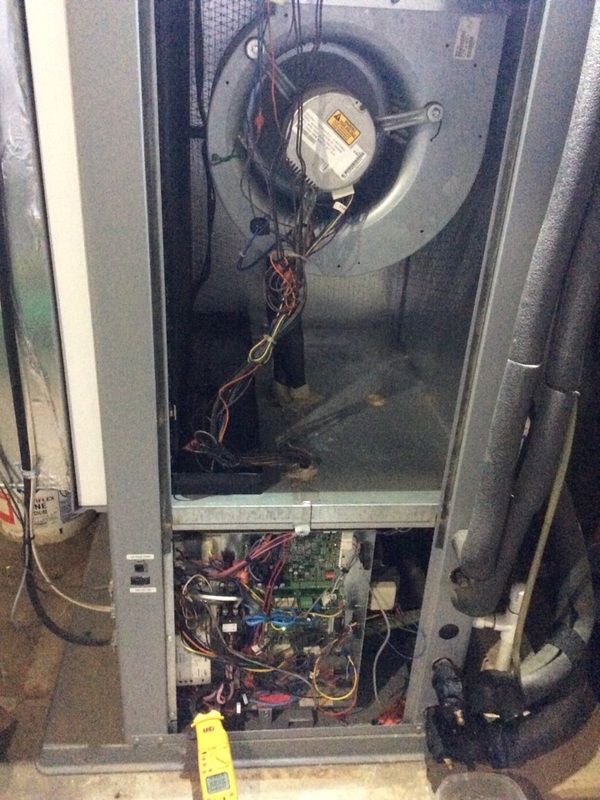 Fall pm on 12/14/18 On arrival set unit to call for heat measured supply and return air temp measured voltage and amps inspected electrical connections checked drain and cleaned checked filter and replaced recommended install uv light unit operating normal at this time.